EARLIER IN DATE THAN PYRAMID-SHAPED HUTS? The claim that, within a given area, a type of hut form is of an earlier or a later date than another one, can only be substantiated if series of properly dated edifices are available. This is far from being the case with the lowly structures which are our current subject. As a matter of fact, there exists – to our knowledge – only one region in which such series can be found and be of some avail: the region of Uzès, Gard. 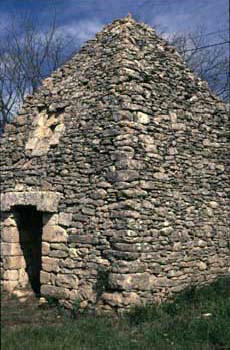 About fifty huts bearing a date inscription are to be seen there (1). 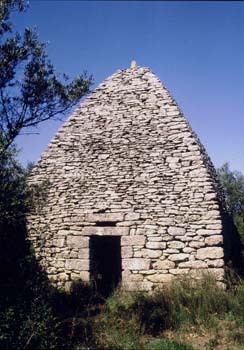 If one looks at the huts with the shape of a full or truncated ogive and a vault topped by a slab bearing an engraved date, one finds that building dates are spread over a period ranging from 1791 to 1838, with a majority of dates between 1791 and 1838 (excluding the much later and isolated date of 1881). 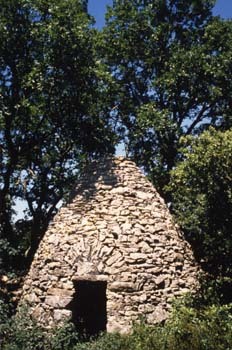 If one considers the pyramid-shaped huts (whether with curvilinear sides or not) whose roofing slab bears an engraved date, one witnesses a spate of dates spread over only two decades, from 1803 to 1824. 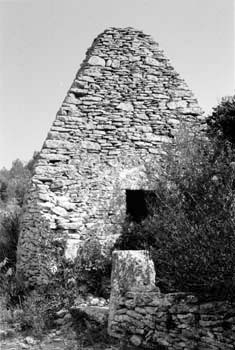 However, if one takes into account two more pyramid-shaped huts, each with a date located in a different spot than the closing slab - ie a lintel (1784) in one case and entrance uprights (1738) in the other - a wider range emerges for the construction period involved (1738-1824). In other words, these statistics vindicate the claim that, far from the pyramid-shaped type having succeeded the ogive-shaped type (2), the two types existed concurrently throughout the great period of dry stone building in Uzège. There was no such thing as a move from the round to the square hut by virtue of some technical advance. The coexistence of the two forms may have resulted, instead, from their respective owners having different priorities with regard to cost and prestige. 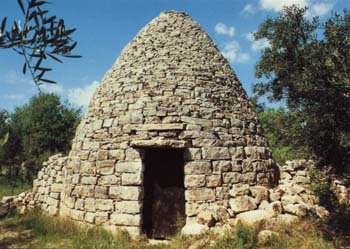 One should keep in mind the fact that round huts need no corners and consequently less building material. Conversely, square huts, with their right-angle quoins, testify to their owners' affluence. 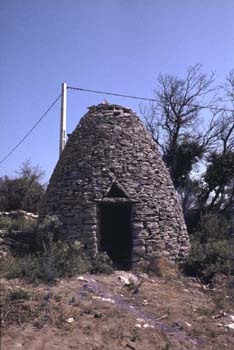 (1) See Christian Lassure and Christiane Chabert, Etude comparée des mouvements de construction de cabanes en pierre sèche dans les Pouilles (Italie) et dans l'Uzège (Gard, France) d'après les millésimes gravés, in Pierre sèche, La lettre du CERAV, N. 9, september 1997. (2) As claimed, without proof, by the author of « Le style architectural des capitelles du département du Gard », an article published in Bulletin de la Société d'étude des sciences naturelles de Nîmes et du Gard, t. 61, 1997, pages 94-105, esp. pages 97-98. 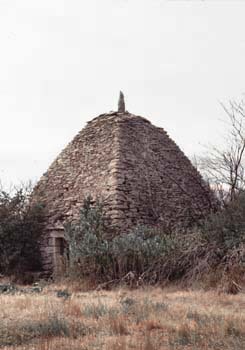 In Uzège, are ogive-shaped huts earlier in date than pyramid-shaped huts?